Last week I published the first in a series of three posts dealing with the Russian digital diplomacy. When analyzing the digital diplomacy reach of Russian embassies to Western capitals and the UN, I found that Russia may be losing out to the west on social media. 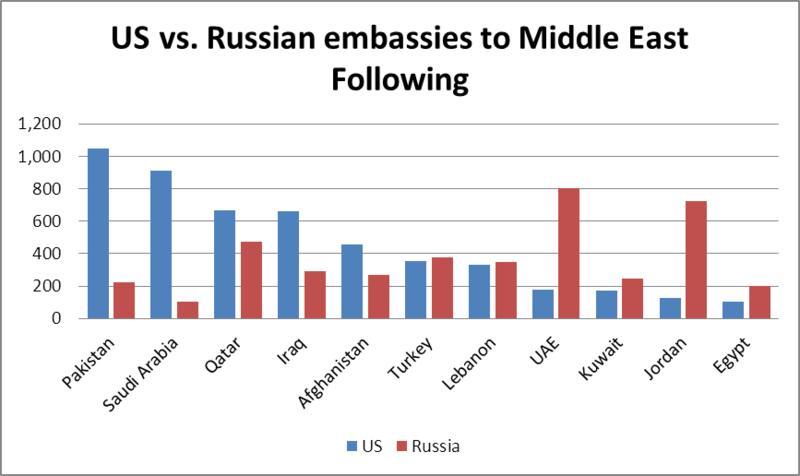 This week I conducted a comparison between Russian and US embassies to three important world regions: the Middle East, BRICS nations and countries situated along Russia’s borders. My aim was to answer two important questions. First, which country (i.e., Russia or US) has a greater reach on social media. Secondly, does the US follows Russia’s suite in failing to use social media in order to gather information and listen to twitter users. In an attempt to explore the extent to which US embassies use social media as a source of information, I complied a sample of 15 US embassies to Middle Eastern countries that are active on twitter. I compared each embassy’s number of followers with its number of “following” meaning the amount of people the embassy follows on twitter. The graph below shows the comparison between the followers and “following” of the 15 embassies in the sample. 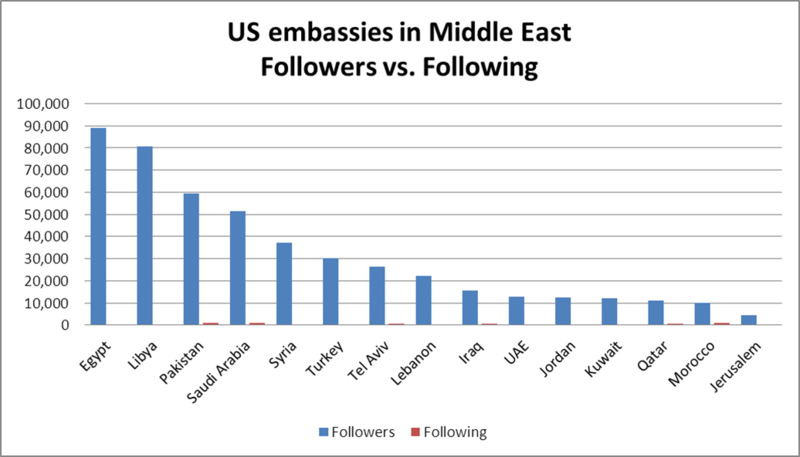 As can be seen quite clearly, while US embassies to the Middle East attract thousands of followers, the rarely follow twitter users. In most cases, the gap is too big to depict in a single graph. For instance, in Afghanistan the US embassy has more than 100 thousand followers but only “follows” 459 twitter users. In Indonesia, the US embassy attracts more than 240 thousand followers but only “follows” 324. 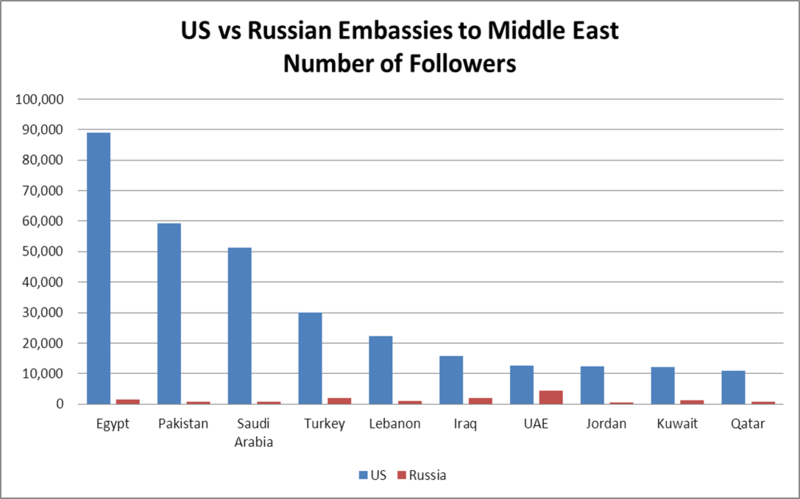 Next, I compared the number of twitter followers US and Russian embassies to Middle Eastern countries attract. This comparison is seen in the graph below. 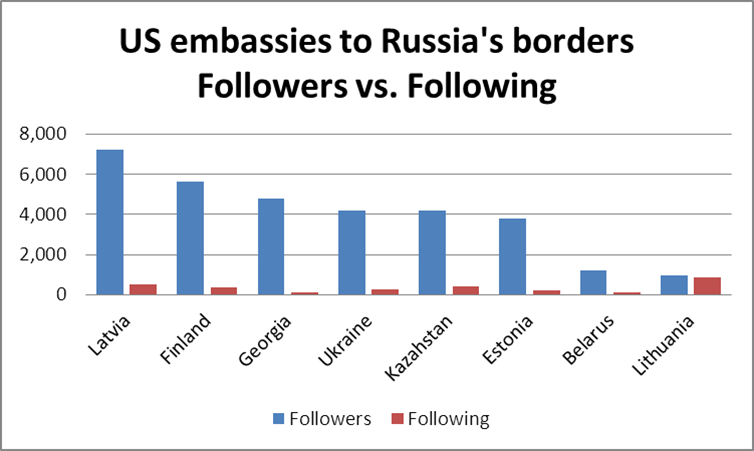 In all countries analyzed, US embassies surpasses Russian ones by thousands of followers. Thus, in this pivotal region, the US seems to dominate twitter attracting massive audiences when compared to Russia. Finally, I compared the number of users US and Russian embassies “follow” on twitter. This analysis compares between the US and Russia’s use of twitter as an information source. However, the “following” parameter may also be indicative of these embassies’ willingness to listen to twitter user and talk with them, rather than at them. The analysis shown in the table below. Here, the comparison between the US and Russia is more complex as Russia “follows” more twitter users than the US in Turkey Lebanon, UAE, Kuwait, Jordan and Egypt. This may indicate a greater ability to gauge public opinion in these countries, anticipate social and political events and tailor foreign policy initiatives to local opinion. 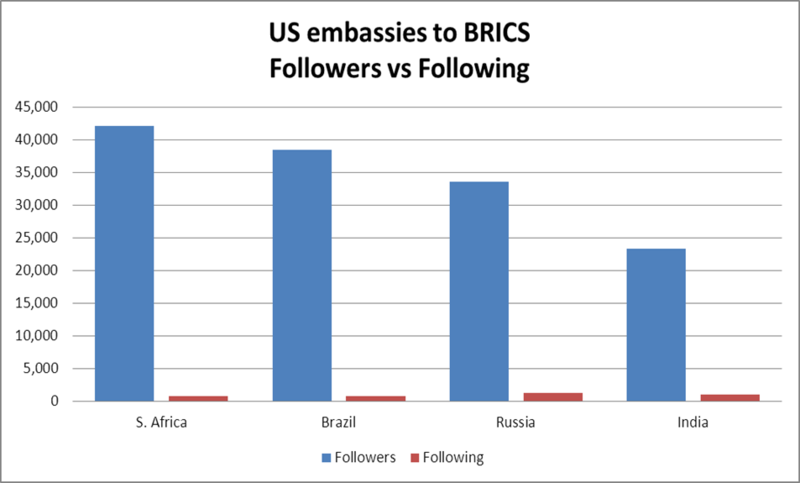 Assessing the extent to which US embassies to BRICS nations use twitter for information gathering called for comparing these embassies’ followers and “following”. This comparison may be seen in the table below. As was the case in the Middle East, the number of twitter followers US embassies to BRICS attract far surpasses the number of twitter users they follow. In South Africa, for example, the embassy has more than 42 thousand followers while the embassy only follows 798 twitter users. 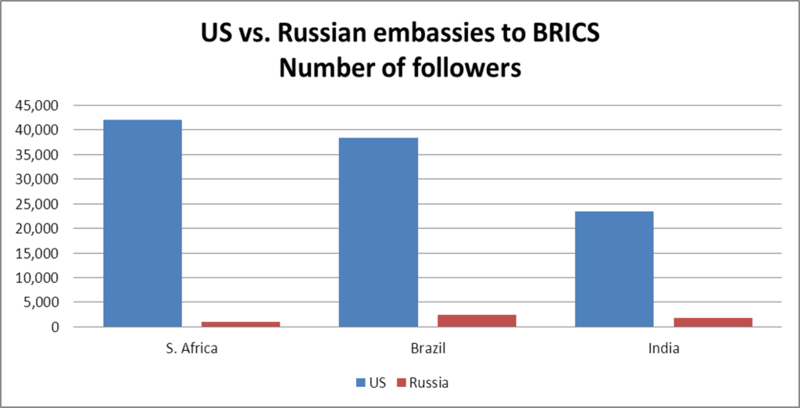 Next, I compared the number of followers US and Russian embassies to BRICS attract. As can be seen in the graph above, US embassies to South Africa, Brazil and India attract many more twitter followers than their Russian counterparts. In South Africa, the US embassy attracts some 42 thousand followers as opposed to Russia’s 1,005 followers. Finally, I compared between US and Russian “following” habits. Thiscomparison is shown in the table below. 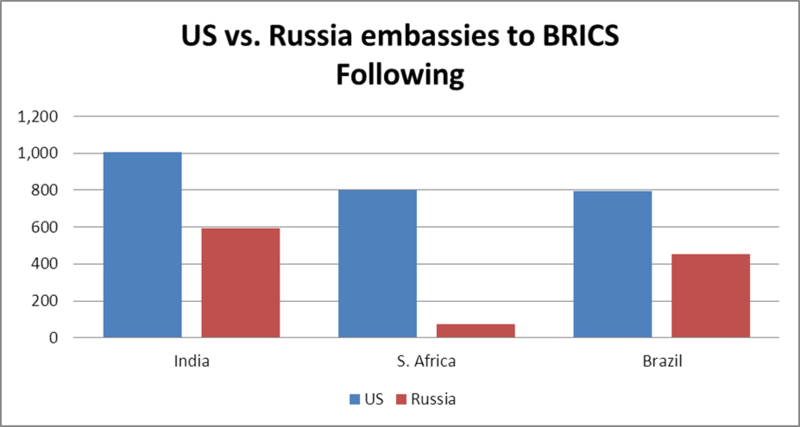 Unlike the Middle East, in the BRICS region US embassies follow more twitter users than Russian embassies. This final analysis is the most similar to the results I published last week as it sheds light on US social media reach in Russia’s “sphere of influence”. 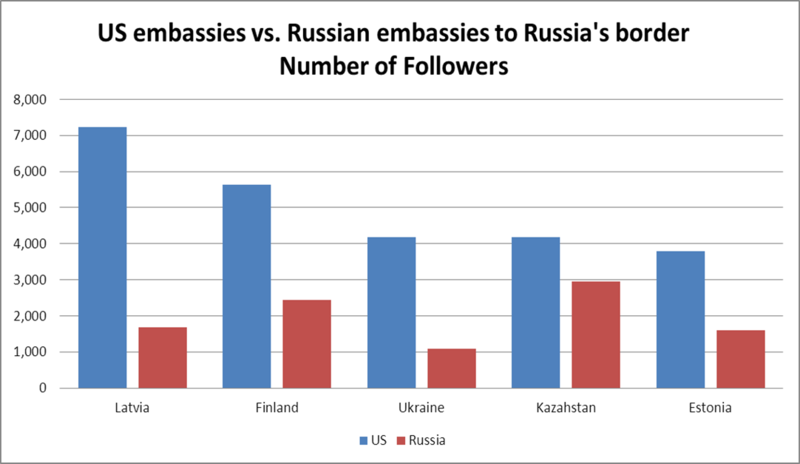 The first graph, shown below, includes a comparison between the number of followers and “following” of US embassies in nations bordering Russia. As was the case in the previous two regions, here too the US seems to be talking at twitter users, rather than with them. The second graph, shown below, compares between the twitter reach of US and Russian embassies (i.e., number of twitter followers). As can be seen, US embassies seem to attract larger numbers of followers than their Russian peers in all nations bordering Russia. Most interesting is the large gap in Ukraine, a major battle ground between the US and Russia. As opposed to the US embassy that attracts more than 4,000 followers, Russia’s embassy has 1,000 followers. Also interesting is the fact that both Russia and the US have a rather small number of followers in this region when compared to the Middle East or BRICS. In Brazil, the US has more than 40,000 followers while in the Ukraine it has 4,000 followers. 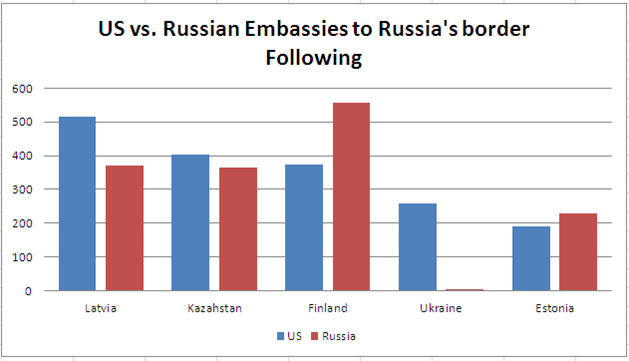 The final graph below shows a comparison between the “following” habits of US and Russian embassies in this region. As can be seen, the US has a greater number of “following” in three of the five nations evaluated. However, Russia outpaces the US in two nations (Finland and Estonia) while the gaps in Latvia and Kazakhstan are rather small. Listening is an important part of digital diplomacy. By following SNS users, embassies may gather intelligence, gauge public opinion and provide foreign policy decision makers with crucial information. This analysis, coupled with the one published last week, could suggest that embassies fail to listen to twitter users. These results also indicate that both Russian and US embassies mostly talk at us, rather than with us. When comparing between the listening habits of Russian and US embassies, the US seems to preform somewhat better than Russia. However, gaps in numbers of “following” were not substantial in two of the three world regions evaluated. This is not the case with reach of embassies on twitter. In all regions, and all countries evaluated in this post, the US outperforms Russia by vast quantities. This is even the case when examining Russia’s “back yard”. Coupled with the results published last week, it is fair to say that the US digital diplomacy mechanism has a global reach to which Russia, presently, can only aspire. As embassy channels are followed by the diplomatic milieu, regular citizens, citizen journalists and news outlets, the US digital diplomacy mechanism may also be more effective than Russia’s mechanism in conveying US foreign policy and US stance on global issues. However, offering a definitive answer to this question would require an evaluation of the identity of US and Russian embassy followers. Posted in BRICS, digital diplomacy, listening, Middle East, Russia, twitter, Ukraine, United States, US. Bookmark the permalink.